Hotels, stores, a post office, and a school operated by Rev. Wicks in the Congregational church served a few white students in the morning and several black students in the afternoon. A public school for white students was constructed in the early 1890s, and a prominent black freedman, Bill Williams, provided instruction and space for black students in 1901. A public school for black students was constructed in 1927. In 1924, a grade 1 through 10 school was built on Ridge Road, just to the east of Dixie Highway (now US-1), which was paved the same year. This building was replaced in 1960 by a new structure, which eventually became the W.F. Burns Elementary School. In 2008, the county school board closed the school (citing budget cuts) and slated it for demolition. County work crews stripped the facility of anything of value. The non-profit Oak Hill Community Trust, with the assistance and guidance of local architect Sid Corhern, Tom Gibbs, and many, many other concerned citizens purchased the property from the county school board in late 2009. A charter school operator was contacted and after voluminous paperwork, was approved in January 2011. Beginning in September 2010, hundreds of volunteers gave thousands of hours of their time to refurbish the buildings. They did plumbing, electrical, painting, landscaping and much more, often with donated materials. The school opened in August 2011, with 260 students enrolled. 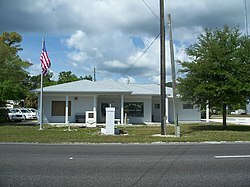 In 2012, Kennedy Space Center donated a surplus 10,000 square foot office building to the school, on condition that it had to be moved from KSC without delay. Again, volunteers stepped forward and the building was delivered (in eight sections) to the site, reassembled, refurbished as classrooms, and is now in use. The school is a STEM (Science, Technology, Engineering, Math) school, and after only two years of operation, has already achieved a "B" rating. As of 2014, there are 385 students in grades K through 8, many are local, and some come from as far away as Ormond Beach and Orange City. In the past, citrus growing and commercial fishing were the primary income sources for residents of Oak Hill. A series of hard freezes, cold snaps and the advent of citrus canker have greatly reduced the number of citrus groves, and by 1995 the State of Florida's Gill Net Ban eliminated most of the fishing business. There are several fish, clam and oyster farms in operation. There is a significant amount of recreational fishing and eco-tourism, and Oak Hill is one terminus for the Florida "River of Lakes" scenic highway. Several regional bicycle paths traverse Oak Hill, and seeing groups of dozens of recreational touring cyclists is quite common. East of the town's center, on the edge of Mosquito Lagoon is Seminole Rest National Historic Site, part of Canaveral National Seashore. Oak Hill has been designated as an "Enterprise Zone" by the State of Florida. There are various tax rebates and incentives available to new businesses locating here and for the expansion of exiting businesses. City government is "business friendly" with a very low paperwork burden for businesses and minimal license fees. Additionally, business owners over the age of 65 get or renew their city licenses for free. The City of Oak Hill was first chartered in 1927. Local government was based on a Mayor-Commission, with each commissioner functioning as head of a municipal department. The city was disbanded in 1930. The country was in a depression, and the city petitioned the government to inactivate the charter, which was granted. The city later petitioned the government in 1962 to reactivate the charter. Clarence Goodrich was the city's mayor from 1963 to 1989, the longest term any mayor has held in the state of Florida. Bobby Greatrex was mayor from 1989 to 1990, and Bruce Burch served from 1990 to 1994. Toreatha Wood became the city's first female mayor, as well as first African-American female mayor, serving from 1999 to 2000. Darry Evans was the first African American male mayor. Lorna Travis was mayor from 2000 to 2001, Susan Cook was mayor from 2001 to 2002, and Bob Jackson was mayor in 2002. Mayor Darla Lauer resigned for personal reasons, and was replaced by Mary Lee Cook. The current mayor is Douglas Gibson, who was elected in November 2012. On the evening of August 1, 2011, the city commission voted to disband the city's police department due to ongoing acrimony, personality conflicts and policy disagreements between the city commissioners and the police department. All nine employees will received unemployment benefits. The Volusia County Sheriff's Department assumed law enforcement duties for the city. Oak Hill is a city on the Atlantic coastline of Volusia County. It is located at 28°53′05″N 80°50′49″W﻿ / ﻿28.884832°N 80.846836°W﻿ / 28.884832; -80.846836. According to the United States Census Bureau, the city has a total area of 11.7 square miles (30.3 km2), of which 6.6 square miles (17.0 km2) is land and 5.1 square miles (13.2 km2) (43.75%) is water. As of the census of 2000, there were 1,378 people, 549 households, and 410 families residing in the city. The population density was 216.1 inhabitants per square mile (83.4/km²). There were 695 housing units at an average density of 109.0 per square mile (42.1/km²). The racial makeup of the city was 81.79% White, 16.26% African American, 0.65% Native American, 0.22% Asian, 0.51% from other races, and 0.58% from two or more races. Hispanic or Latino of any race were 0.65% of the population. The 2010 Census shows 1,792 people (an increase of 30% since 2000) and 1,044 dwelling units, with 247 dwellings vacant, vacant for rent or vacant for sale. There were 797 households in the city, 638 of which were owner occupied dwellings (total population of 1,418 people, or 2.2 people per household). Population density in 2010 is 271.5 people per square mile (up from 216.1 per square mile in 2000). Note that this number is not precise because the area of the city has increased somewhat since 2000 through annexations. The 2010 racial makeup of the city shows only small changes from 2000, White is 83.15% (from 81.79% in 2000), African American is 13.89% (from 16.26% in 2000), all other ethnicities combined total just under 3%. Of the 549 (in 2000) households, 25.3% had children under the age of 18 living with them, 60.3% were married couples living together, 8.9% had a female householder with no husband present, and 25.3% were non-families. 20.6% of all households were made up of individuals and 10.2% had someone living alone who was 65 years of age or older. The average household size was 2.51 and the average family size was 2.84. In the city, the population was spread out with 22.1% under the age of 18, 6.9% from 18 to 24, 24.6% from 25 to 44, 25.4% from 45 to 64, and 21.0% who were 65 years of age or older. The median age was 42 years. For every 100 females, there were 106.9 males. For every 100 females age 18 and over, there were 104.0 males. The median income for a household in the city was $32,130, and the median income for a family was $35,682. Males had a median income of $24,643 versus $22,917 for females. The per capita income for the city was $16,158. About 7.8% of families and 14.4% of the population were below the poverty line, including 25.0% of those under age 18 and 6.8% of those age 65 or over. ^ "Profile of General Population and Housing Characteristics: 2010 Demographic Profile Data (DP-1): Oak Hill city, Florida". U.S. Census Bureau, American Factfinder. Archived from the original on September 11, 2013. Retrieved February 16, 2012. ^ "Oak Hill Police Department Disbanded". Local 6. August 1, 2011. Retrieved 2011-08-02. ^ "Geographic Identifiers: 2010 Demographic Profile Data (G001): Oak Hill city, Florida". U.S. Census Bureau, American Factfinder. Archived from the original on September 11, 2013. Retrieved February 16, 2012. This page was last edited on 19 May 2018, at 13:52 (UTC).